It is interesting that both extra heart beats/palpitations and skipped beats are typically due to the same cause: the regular heart rhythm is interrupted by a premature or early beat. 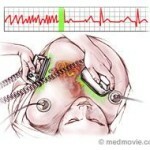 When the premature beat arises in the atria (upper heart chambers), it is called a premature atrial contraction (PAC). When it arises in the ventricles (lower heart chambers), it is called premature ventricular contraction (PVC). 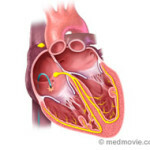 In most cases, both PACs and PVCs are not considered dangerous, though some exceptions exist. The reason PVCs or PACs are sometimes felt as a skipped beat, is because when the heart receives a premature signal to contract before it has had sufficient time to fill with blood, the heart contraction does not send enough blood flow to the rest of the body. A pause may be felt, and the following heart beat is more forceful than usual. 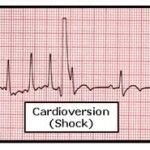 If the PVC or PAC is less premature, whereby the heart has had time to sufficiently fill with blood before receiving the early signal to contract, an extra beat will be felt rather than a skipped beat. Premature beats are quite common in healthy people of all ages. 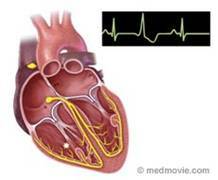 Stress, alcohol, caffeine, and fatigue may cause PVCs or PACs to occur more often. If the symptoms caused by premature beats are bothersome, they can be treated with a catheter ablation or medications.